Winters in Southern Ontario can be harsh, and that’s why Pro Landscaping pleased to offer Caledon snow removal services. Our team of environmentally conscious technicians can clear your property of snow and ice safely and effectively. 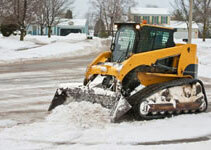 When it comes to snow removal, Caledon residents know that removal methods must be safe, effective, and timely. Our environmentally conscious team is dedicated to clearing snow and ice from the exterior of your building, no matter how harsh or heavy the storm!